Antique stoves are a beautiful addition to a vintage kitchen. Recently LoveToKnow had the opportunity to talk to Sara, of Good Times Stove Company about antique wood burning stoves. LTK: What made your family decide to become involved in the restoration of antique stoves? Sara: Exquisite beauty, impeccable craftsmanship. My dad is a collector of many things and realized that his collection of eight antique stoves represented a great business opportunity. The oil embargo of the 1970s had settled in and steep fuel prices spurred an unprecedented interest in alternative energy options. This was especially true in the home heating arena. Western Massachusetts' proximity to all parts of New England and New York afforded a unique reservoir of the finest and earliest antique stoves ever made. This is where the antique stove industry first took root in America. There is no stove manufacturer anywhere that can produce the value found in antique wood, coal or gas stoves. Today no one has the ability to reproduce these stoves with the same attention to quality and craftsmanship as the original creators. LTK: Can you explain the process of restoring a wood burning stove? Sara: A typical restoration is described below. Paint stove with a temperature resistant paint. Seal stove for an air-tight burn. Restorations are performed with attention to preserving antique authenticity, efficient function, ease of operation and aesthetics. An initial assessment of the stove is issued using photos. Only a physical inspection of the stove allows us to provide the most accurate restoration estimate. When we begin its restoration, we will catalog missing parts, broken grates, and damaged nickeling of your antique stove. Stoves are then dismantled. The body is sandblasted and painted black to ease future maintenance and cleaning. Enamel finishes are cleaned and touched up. The nickeling for each stove is individually assessed and will be replated as needed. Upon completion, every antique stove is restored as close as possible to its original showroom condition. Every stove bears markings and characteristics that reflect its unique history and life, signs of its years of service to generations of families and homes since the turn-of-the-century. These stoves are well-loved and have lived long, useful lives. The Good Time Stove provides TLC and rehabilitation to these time travelers to return to full service and restore original beauty. LTK: How difficult is it to convert an antique wood burning stove into an electric or gas stove? Sara: Every individual stove we produce is a custom conversion, offering any feature you could ask for from a premium modern cook stove while maintaining the astounding and unique beauty of a historic American icon. We offer a choice of four to six gas burners, electric burners, or a combination of both. Our gas burners produce 9,000 BTU's. These are cast iron burners as seen in commercial stoves, not pressed metal. All burners feature pilot ignition. In electric burners we offer a choice of cast iron, solid electric burners or the coil type. They come in a six or eight-inch diameter putting out 1,500 watts and 2,600 watts respectively. Stovetop griddles can also be installed. Ovens can be gas or electric, in combination with any burner configuration. Electric ovens come equipped with a pre-heat cycle, broiler, oven light and an external safety light, to let you know when the oven is on. All oven boxes are constructed of 24-gauge stainless steel with adjustable oven racks. Controls are concealed behind the "firebox" door to maintain the period look. Converting an antique heating stove to gas or electric offers an even temperature and an efficient heating source while maintaining the charm and enchantment of an old-fashioned treasure. Gas logs placed in the heating stove will allow you to enjoy the amber glow of a fire without the fuss of wood. LTK: Are there some stoves that just are not worth restoring? Sara: Rarely, but every situation varies according to the stove and the needs/interests of its owner. LTK: Where do you get the stoves to restore? Sara: All over New England and New York, but sometimes from clear across the country or Canada. If you can get the stove to us, we are happy to consider it. LTK:How difficult is it to cook on an antique wood burning stove? Sara: Takes some getting used to but nothing that a little practice and determination will not make you a master of. LTK: Do you have a vintage stove yourself? Sara: We heat both our house and showroom with antique cylinder stoves. 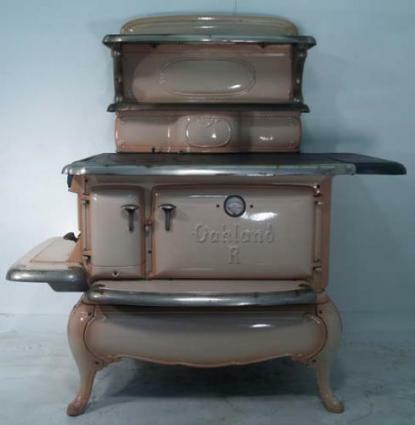 LTK: Are there special requirements for adding an antique wood burning stove to a kitchen? Sara: An antique wood burning kitchen cook stove must be located a minimum of 36 inches from unprotected woodwork and other combustible materials. The addition of a heat shield or other protective devices to the wall or the stove allows a reduction of those distances by 50 percent. With heat protection the stove only needs to be 18 inches from a combustible wall and 9 inches from a noncombustible wall. The wood-burning stove needs to be vented. This is done through a class-A, double-walled chimney. An antique cooking stove that has been converted to gas or electric does not require any clearance space. The stove is completely insulated and emits no heat. These stoves do not need to be vented. Love to know wishes to thank Sara and Good Times Stove Company for taking the time to share their knowledge. If you have a stove, or are interested in one, you can contact Sara at the Good Time Stove Company website.